Refugee Week is an annual event and this year the theme was ‘Welcome’. Throughout the UK there were displays and arts, cultural and educational events and activities. 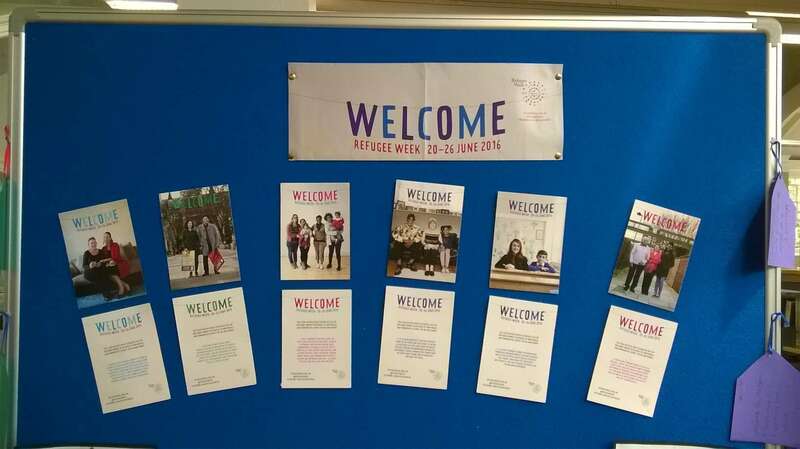 Here in Malvern, Refugee Week was marked by a display in Malvern Library. This included short biographies of some refugees who have found sanctuary in the UK. Also on display were children’s books telling stories relating to refugee issues and cards with some touching and heartfelt messages to refugees from people in Malvern. The display was reinstated on Friday 24th, having been removed from the library for the three days leading up to the EU referendum for ‘purdah’ reasons. This surprised us as the display did not aim to campaign on any issue. The purpose was to provide information and to raise awareness of the reality of refugee issues, to celebrate the contribution of refugees to the UK and to promote better understanding of why people seek sanctuary. An excellent list of children’s books telling refugee stories has been compiled by Karen Argent of the Letterpress Project. The display will be in the library until July 2nd.